A great Independence Day with the US flag waving. July 2011, the entire state of Oklahoma was placed under the local fire bans. These bans kept Oklahomans safer; especially throughout July 4, 2011. The amount of Independence Day accidents (mostly from at-home fireworks and sparklers) that usually occur during the fourth of July was significantly decreased. This meant more Oklahomans had an enjoyable and safe Independence Day with their family and friends. The public July fourth displays were carefully professionally orchestrated due to the local fire bans. Participants who attended claimed they had a great time with their friends and families; all enjoyed the July fourth professional fireworks displays. The favorite firework display was that of the US Flag, truly inspiring and awesome. Attending the public fireworks displays are safer for the Fire Departments usually are the ones setting off the fireworks. These true American heroes are ready for anything negative fireworks can do. This leads to a safe and happy Independence Day experience; which is exactly what the majority of Oklahomans had. 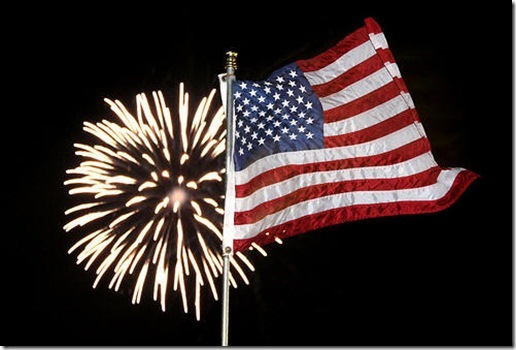 Hope your Independence Day was filled with much fun and joyful memories. Ours definitely was. We even managed to squeeze in a few Independence Day favorite programs on the television to pleasantly round off this Federal Holiday.